Metal roofs were popular in the 1800s and early 1900s. Homeowners found themselves walking on old metal roofs to apply sealers and nail loose sheets down. Today's metal roofs are virtually leakproof, rustproof, and are low maintenance. 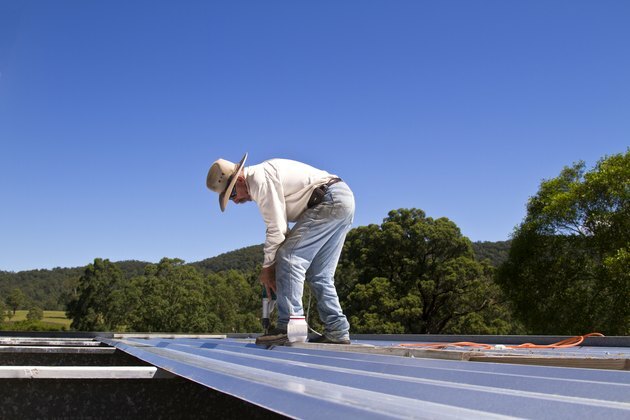 There are still instances when you may need to walk on a metal roof, though, like to inspect it. Check the condition of a roof from the inside before you attempt to walk on it. If it's a metal roof on a barn, garage, porch, shed, carport, et cetera, you should be able to do this. Look for rotted beams, broken or missing lathe boards or sheeting, and other signs the roof is soft in places. Wear soft, rubber-soled shoes for the best traction. Position your ladder as close to where you need to be on the roof, but away from any known weak spots. It should extend at least 3 feet above the roof edge so you have something to hold onto. Climb up the ladder and step carefully onto the metal. Old metal roofs usually have a certain amount of give, so expect that. Proceed to walk safely on the metal roof by staying on, or at least near, the rafters. You'll know when you step on a rafter because it will feel solid underfoot, unless the rafter is rotted, of course. Rafters are normally located 16 to 24 inches apart. Avoid walking on the seams. Walk up a roof and lean your body over towards the roof to help maintain your balance. The steeper the metal roof, the more you'll need to lean over. Crouch down slightly to walk down a metal roof safely. Walk up or down a slightly inclined roof by walking as you would on the ground, but slowly. Walk up a steep roof sideways. That is, instead of stepping straight out in front of you, place your feet, one at a time, sideways as you step up. Use a roof safety harness to walk safely on a roof if it's in poor condition or if it's very steep. Basically, a harness attaches you to the roof to prevent falling if you lose your footing. Make sure you follow the directions on how to put the harness on according to the instructions from the manufacturer because each brand can vary. Make sure it fits tight and check buckles.